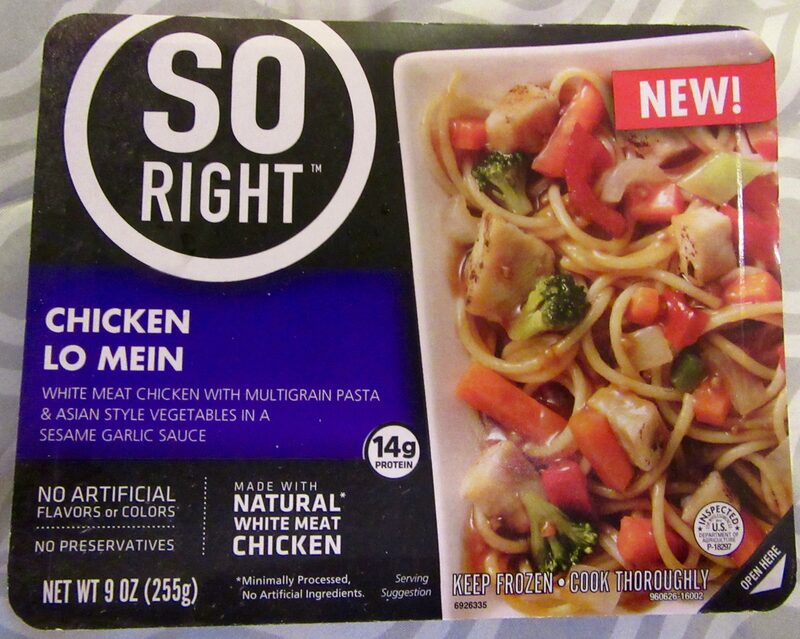 Product Review: So Right Frozen Entrees! Working peeps know this much: buying lunch in the office cafeteria, or out on the street, provides you with a greater variety of tasty meal choices, but it can get pricey over the course of a week. The thing is, bringing lunch from home isn’t always an enticing option for those of us who don’t cook, and who don’t want to be stuck with a boring sandwich every day. We all want good taste and variety, but we want to save a little cash also. 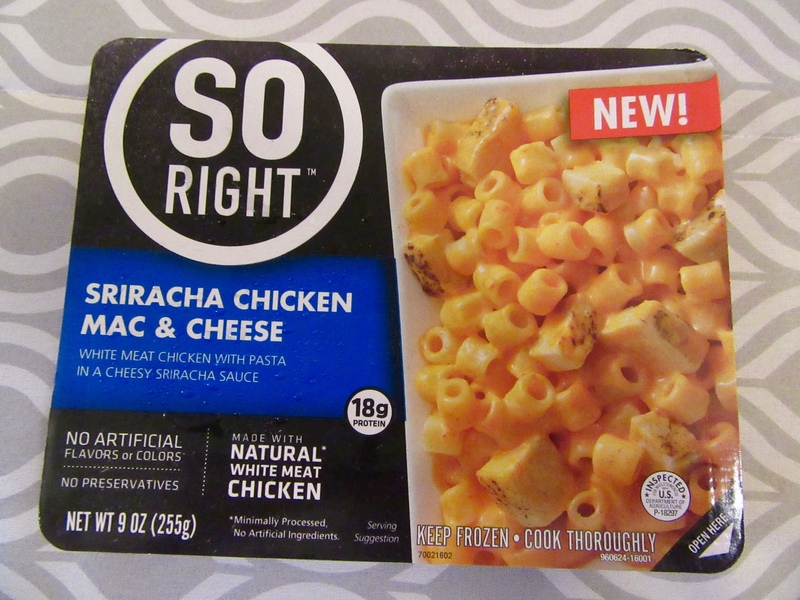 This is where So Right’s recently introduced line of single-serve frozen entrees comes in! 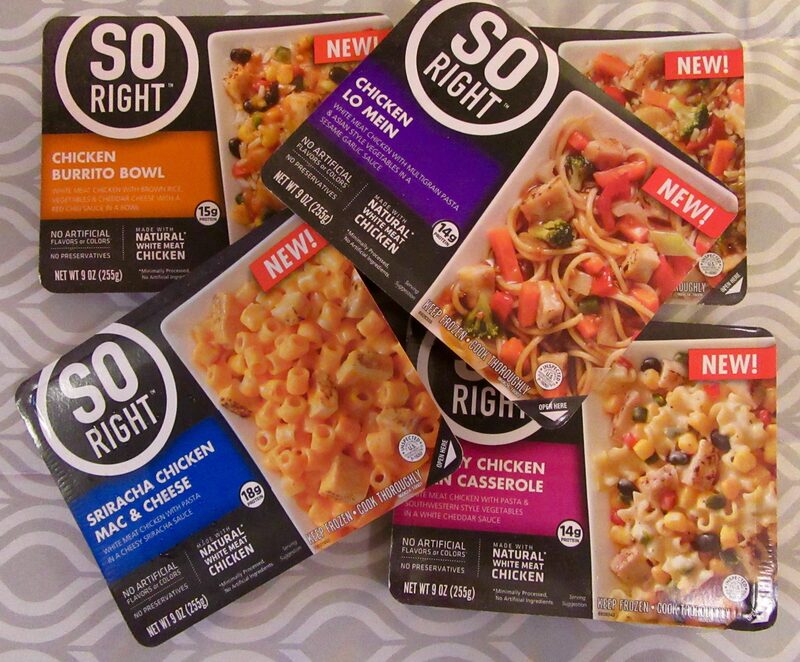 So Right microwave meals (from Bellisio Foods) are made with 100 percent natural ingredients like white meat chicken, roasted vegetables, and whole grains. To put an emphasis on a healthier lifestyle, they are free of trans fats, high fructose corn syrup, and artificial colors and flavors; and are preservative-free. 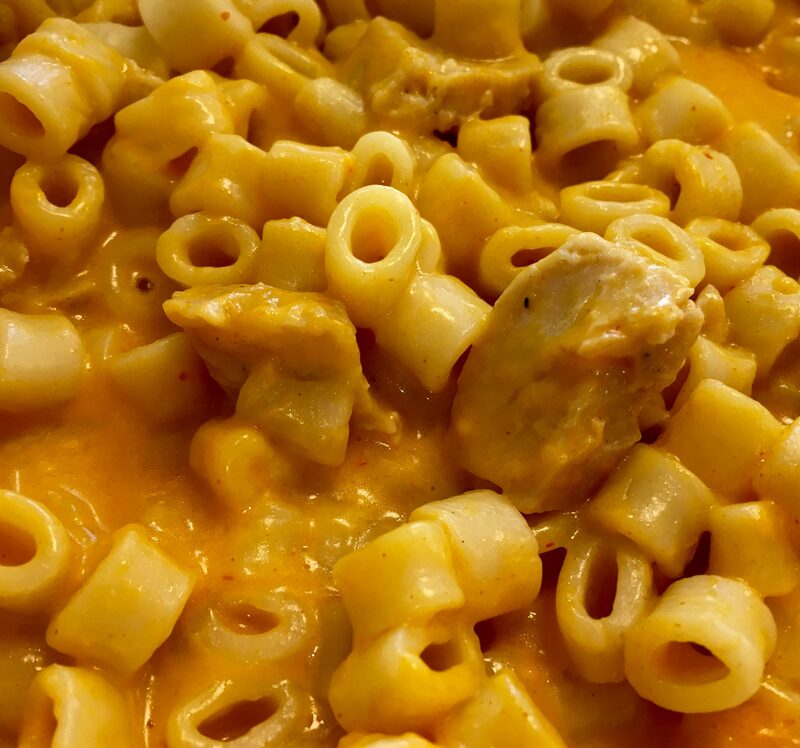 Tempting flavor varieties include Sriracha Chicken Mac & Cheese, Chorizo & Potatoes with Cheesy Chipotle Sauce; and Creamy Chicken Corn Casserole — comfort foods that taste especially delicious when it’s cold outside! Best of all, So Right entrées come at an unexpected and affordable price – the average retail price is just $1.80 per meal! That’s insane! 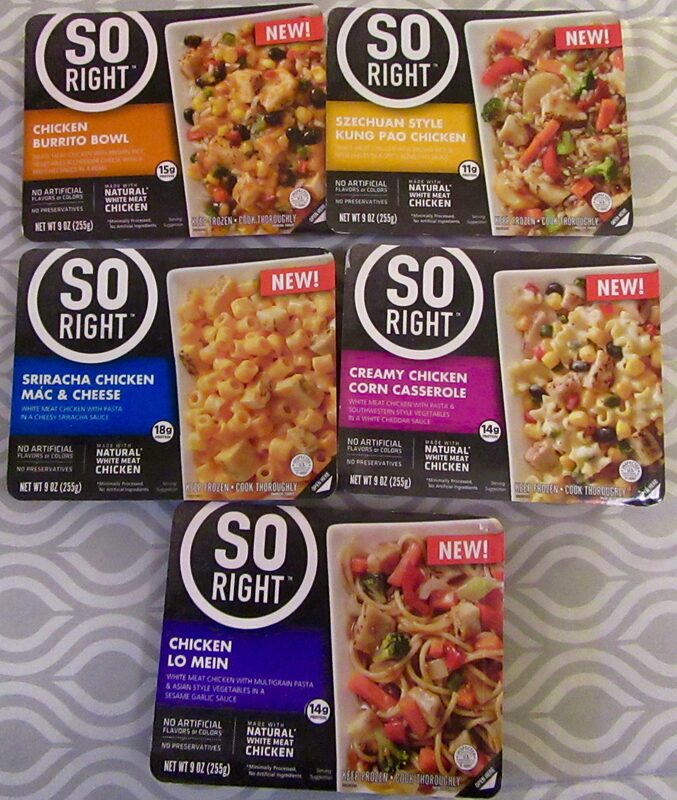 After meeting brand representatives at the Health and Nutrition Editor Showcase event in NYC, So Right sent me an assortment of five different meals (seen above) to review for The Gig, which I prepared in the office and enjoyed for lunches over the course of one work week. My findings follow! 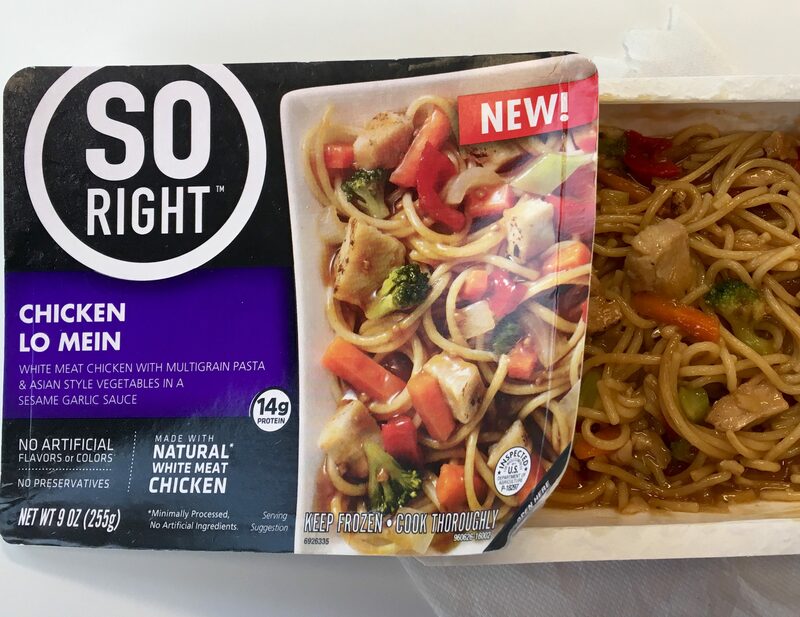 Appearance: What is the dish’s degree of visual resemblance, after coming out of the microwave and being sufficiently stirred, to the photo on the front of the box. Quality of the individual ingredients: Self explanatory. Taste: What were the most (or least) appealing flavor and textural qualities once the food was in my mouth. Enjoy-ability Factor: How good, on a scale of 1 to 10 — with 10 being best — did eating the dish make me feel. Ready to have some fun? OK, here we go! The Hype: We sliced up a piece of all-white-meat chicken and threw it together with a veggie mix of red bell peppers, poblano peppers, and corn, as well as some tasty black beans. We then topped it with some cheddar cheese and a red chili sauce rich with paprika and cumin flavors. The final result: One of our favorite meals that’s ready to enjoy in minutes. 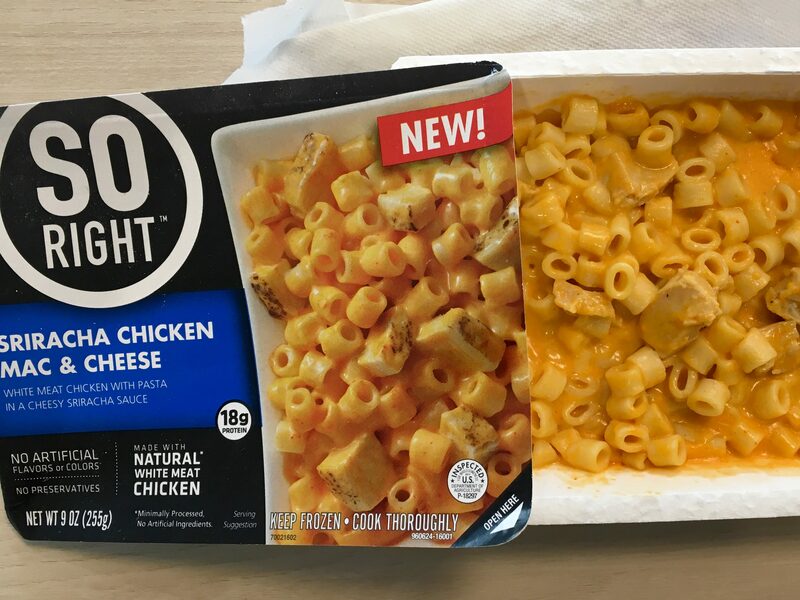 Appearance: Does it look like the picture on the box? Pretty much, yeah. Quality of the individual ingredients: This dish contains many familiar-favorite southwestern-style ingredients (listed above), on top of a bed of white rice. There is also a red chili sauce, and a small amount of cheddar cheese that melts into the sauce upon cooking. As is the case with most pre-cooked chicken found in a frozen entrée, the meat was not exceptional, but it was decent. All other ingredients were of the quality that you would find in a home-cooked meal. Taste: Who doesn’t love a Burrito Bowl in all of its endless variations? 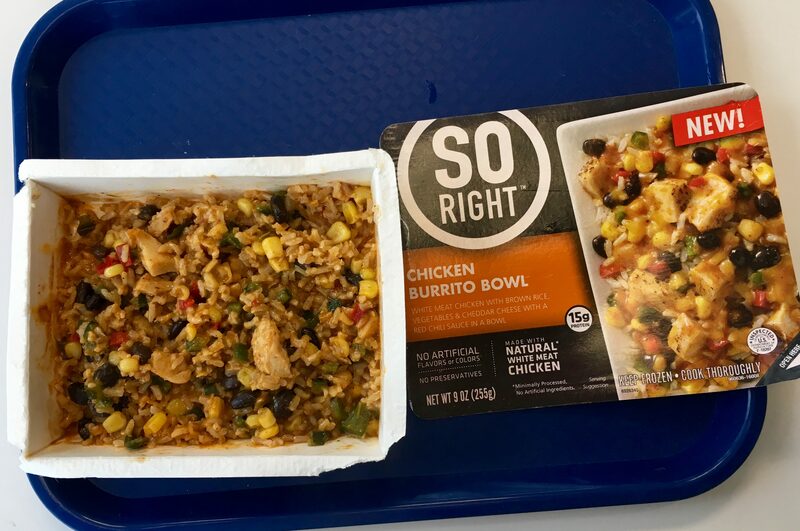 While it is not going to compete with the indulgence of a trip to Chipotle, the So Right Chicken Burrito Bowl is an excellent choice for a light lunch. 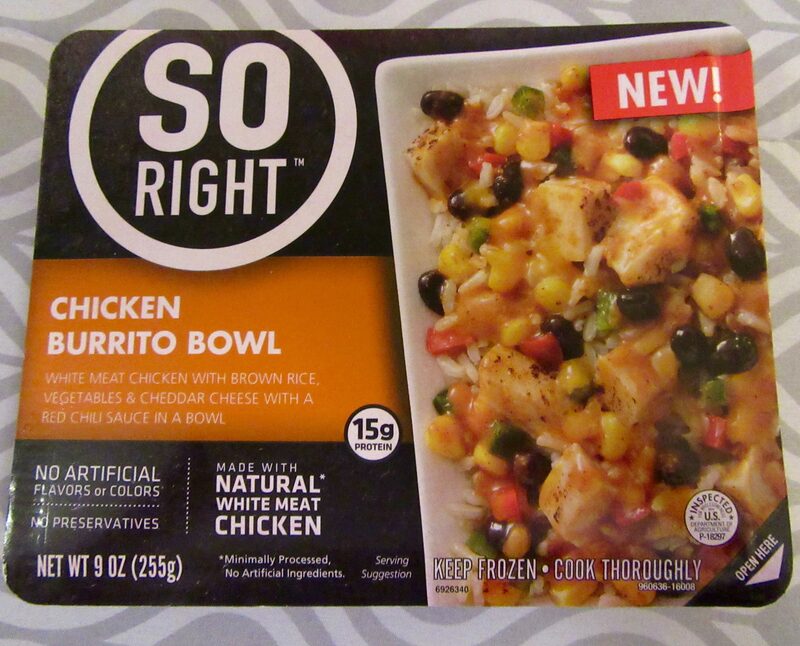 Eating the So Right Chicken Burrito Bowl reminded me of eating chili over rice with some corn in it, so if you love chili, you will be very attracted to the comforting paprika and cumin flavors of the sauce. Very tasty. Enjoy-ability Factor: 9. A dollop of sour cream or a handful of tortilla chips would have upped that factor to a 10. 300 Calories. Read more about this entrée at This Link. The Hype: Multigrain pasta and a mix of vegetables that includes carrots, broccoli, onions, and red bell peppers is the base for this dish. 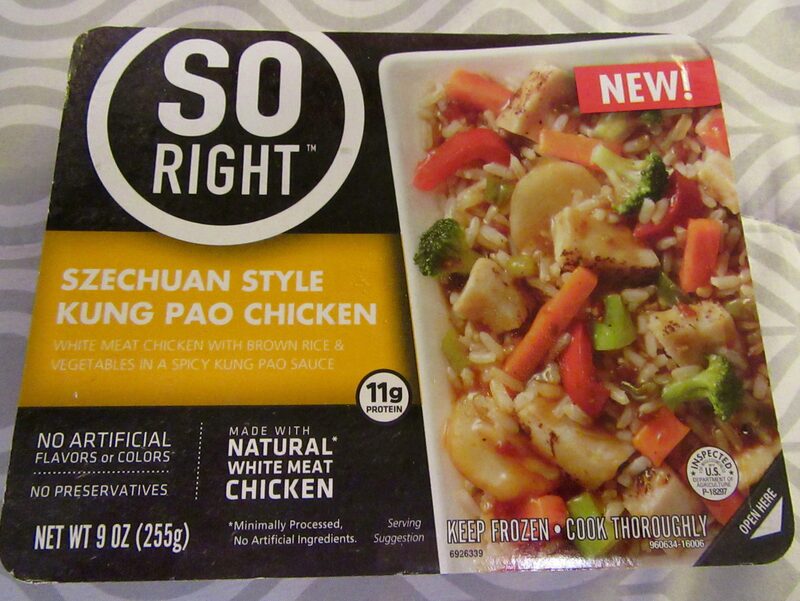 We added in all-white meat chicken and covered it in a tasty sesame garlic sauce to create a delicious Asian-style meal. Appearance: It could have used more broccoli. Quality of the individual ingredients: The Lo Mein Noodles are quite clearly spaghetti noodles. Otherwise, all good. Taste: The distinguishing flavor profile is a sweet-soy sauce taste. If Take Out Chinese Food is your thing, you will not be disappointed. 270 Calories. Read more about this entrée at This Link. The Hype: This delicious meal starts with the perfect cheesy base and adds an exciting chili pepper twist to create a cheesy sriracha sauce. The addition of pasta and all-white-meat-chicken make this a meal you’ll be sure to remember. Appearance: This entrée’s appearance is remarkably faithful to the picture on the box, except that is has more sauce than in the photo. Quality of the individual ingredients: Of the five entrees I sampled, the chicken in this dish was especially was tough and gristly. I picked it out. The pasta is on the well-done side, which I enjoy, and the sauce is very rich and flavorful with a powerful spiciness. Taste: Once I got rid of the chicken, the meal was delicious! I’m a Mac & Cheese lover since birth, so the mix of tender pasta and creamy cheese sauce make this a very good comfort food choice. And when they say Sriracha, they aren’t kidding. The bold and spicy flavor kick from the sriracha elevates this from a kids’ meal to an adult meal. Unless your kids like the taste of fire. Enjoy-ability Factor: Without the chicken, a 10. 390 Calories. Read more about this entrée at This Link. The Hype: All-white-meat chicken with pasta and a vegetable mix made up of yellow corn, poblano peppers, red bell peppers, and black beans is the base for this delicious meal. We cover it all with a creamy white cheddar cheese sauce to create a tasty casserole that has a twist that can only come from the southwest. 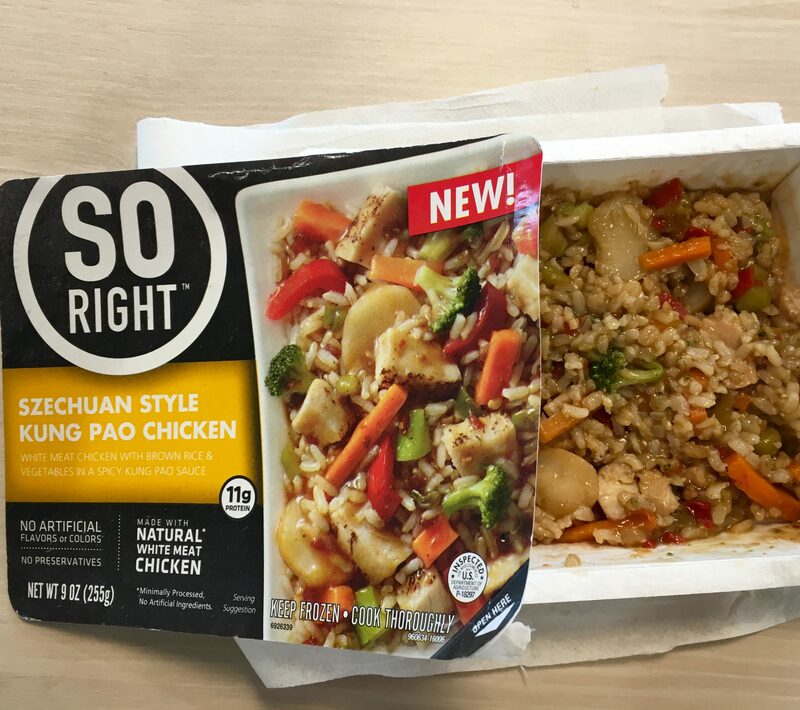 Appearance: Does it look like the picture on the box? It does. 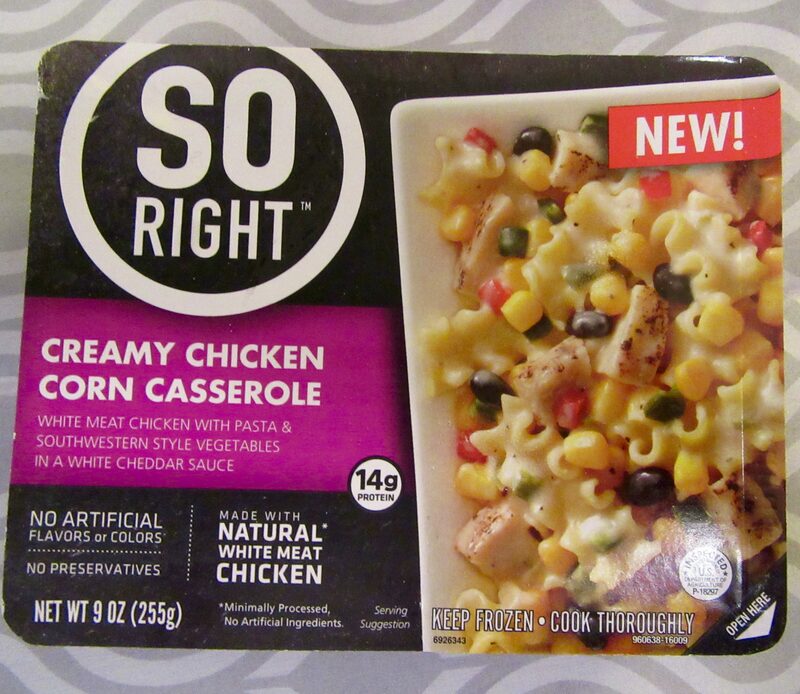 Quality of the individual ingredients: While the Creamy Chicken Corn Casserole is somewhat of an unusual combo of beans, southwestern style veggies and noodles, it somehow works. Taste: I enjoyed the tender pasta in this and the addition of corn and beans. The cheese sauce is really is very mild (so much so that it almost tasted like a gravy to me) but that gives it a homemade taste. It reminded me of eating a Pot Pie without the crust. I liked it. 310 Calories. Read more about this entrée at This Link. The Hype: The right combination of all-white-meat chicken served over brown rice with a vegetable mix of broccoli, carrots, red bell peppers and green onions. We tossed a few water chestnuts and some Szechuan peppercorn spice into the sauce to create a delicious meal with the right kung pao kick. 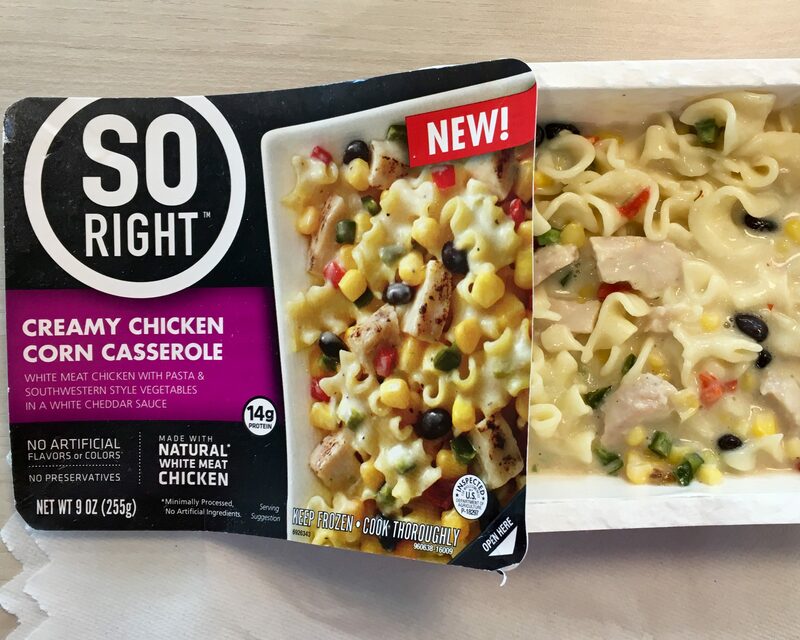 Appearance: Does it look like the picture on the box? Yes. Quality of the individual ingredients: This entrée had the best quality chicken of the bunch, with overall high quality ingredients and, especially, crispy water chestnuts! Bonus points for using Brown Rice! Taste: The Kung Pao sauce had a sweet taste similar to the lo mein meal (which is expected) and it was spicy enough to make my nose run. Enjoy-ability Factor: I’m going to put this one in the Take Out Chinese Food category and give it a 9. To find a store in your area that sells So Right entrees, visit This Link!